Position an oven rack 6 inches from the broiler element and heat the broiler to high. 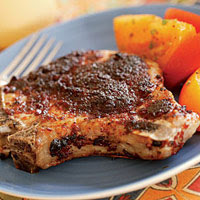 Set the pork chops on a heavy-duty rimmed baking sheet or broiler pan. Season both sides of the pork chops with the salt and a few grinds black pepper and then cover both sides of the pork with the pesto--it should completely cover the pork. Let it sit for 10 minutes. Broil until the pesto darkens and any exposed parts of the pork chops become brown, about 4 minutes. Flip and continue cooking until the pork becomes firm to the touch and registers 145 degrees F on an instant-read thermometer, another 5 to 7 minutes. Transfer the chops to serving plates. If any pesto remains on the pan, scrape it up and top the chops with it. Serve immediately. Put all the ingredients in a food processor and pulse until finely chopped and pasty. This entry was posted on 9:50 PM and is filed under Pork . You can follow any responses to this entry through the RSS 2.0 feed. You can leave a response, or trackback from your own site.